Saurashtra's wicketkeeper-batsman Snell Patel got a lifeline as the right-handed batsman was not ruled out by the on-field umpire despite gloving a catch in the ongoing 2018-19 Ranji Trophy final. The batsman gloved a ball straight into the hands of the fielder at the short leg, however, he was not asked to walk back to the pavilion. Saurashtra and defending champions Vidarbha are playing in the final of 2018/19 season of India's premier FC tournament, Ranji Trophy at the VCA stadium in Nagpur. Vidarbha batted first and posted a total of 312 runs on the board. The bowling attack of Vidarbha helped them gain the upper hand in the match by picking some crucial wickets at regular intervals to reduce Saurashtra to 115/4. The Vidarbha bowlers were successful in picking the wicket of Snell Patel soon but due to an umpiring howler, Snell is still on the crease. Every single person, who has played cricket at any level, knows that ONE guy who while batting reacts the way Saurashtra's Snell Patel does after getting away with one! Off the fourth ball of the 45th over of Saurashtra's 1st innings, Snell Patel gloved a delivery of spinner Akshay Wakhare straight into the hands of the fielder at short leg. The fielding team made a huge appeal and even the batsman started walking back but the on-field umpire Anil Chaudhary did not rule Patel out. The entire Vidarbha team was disappointed as the ball had made contact with the batsman's gloves first after it hit his thigh-pad. 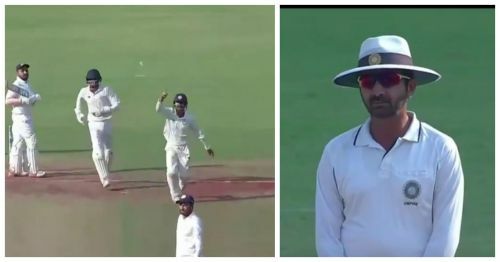 This is not the first umpiring howler in the Ranji Trophy 2018/19 knockout stage as there were a lot of wrong decisions given by the umpires in the quarters and semis of the tournament include the one that saved Cheteshwar Pujara and Saurashtra in the semis against Karnataka. Snell Patel scripted a fightback from Saurashtra's side after that incident as the wicket-keeper batsman is currently unbeaten on 86 as Saurashtra are still 154 runs behind Vidarbha's first innings total and have five wickets in hand heading into day 3.